There are currently 3,417 users on this website. Hi, could someone please show me the Scott catalogue entry for Montenegro 129A-E and 130. 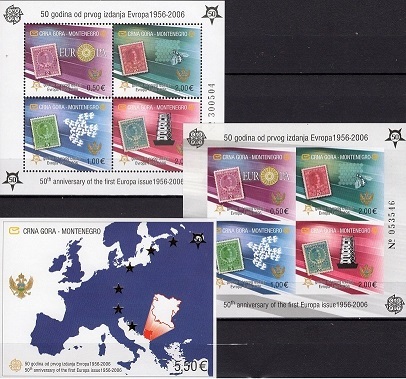 I believe these are the entries for the 2006 Europa 50 yr anniversary issue. My issue is that I've seen 4 different varieties of the souvenir sheet available online for purchase, but can't find specific information about these issues. I don't have access to a recent Scott at the moment. Also, if there are entries on these in other catalogues, I would appreciate seeing those as well. A variant of Block 2B exists,with no grey stripes. Thank-you! This confirms what I'm seeing on offer. Also thought I saw a Block 2B with a grey border, but this was likely a dark photo/scan. 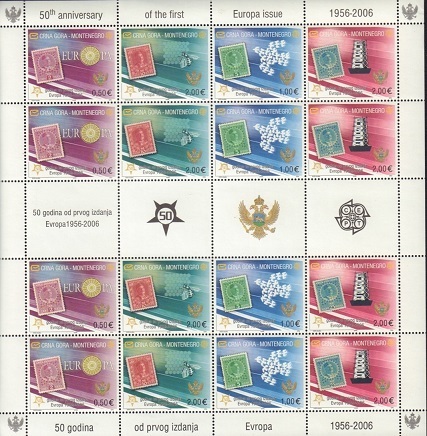 The strip of 4 has a white border around each stamp, which is face different from the souvenir sheets, making for four varieties to collect (not counting Block 3). Well-played, Montenegro. It took 0.25 seconds to lick this stamp.